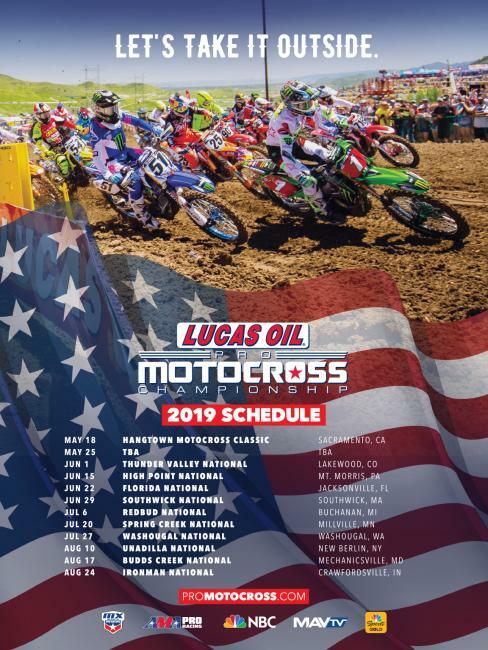 The Lucas Oil Pro Motocross Championship, sanctioned by AMA Pro Racing, features the world's fastest outdoor motocross racers, racing aboard the best bikes each factory offers, on the roughest, toughest tracks in the world. The 12-rounds series begins at Hangtown in May and ends at Indiana's Ironman Raceway in August. It includes stops at the premier motocross racing facilities in America, with events in California, Colorado, Pennsylvania, Florida, Michigan, Massachusetts, Maryland, Minnesota, Washington, New York and Indiana. The pro riders race on Saturday afternoon, with competition divided into two classes: one for 250cc machines, and one for 450cc machines. The Lucas Oil Pro Motocross Championship is managed by MX Sports Pro Racing, the industry leader in off-road power sports event production. The series is televised on NBC, NBCSN and MAVTV and streamed live on NBC Sports Gold. More information can be found at www.ProMotocross.com.